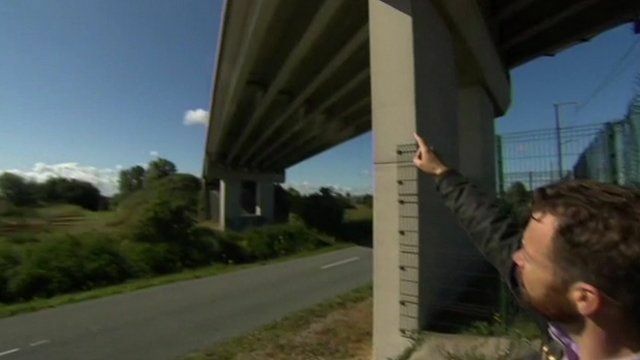 How migrants enter tunnel site Jump to media player The BBC's Peter Whittlesea explains the route migrants take to gain access to the railway tracks that run through the Channel Tunnel. UK 'doing all it can' on Calais migrants Jump to media player The situation at the French port of Calais involving migrants attempting to reach Britain is "very concerning", Prime Minister David Cameron says. Eurotunnel delays as tyres set alight Jump to media player Eurotunnel say protestors have set fire to tyres and blocked a motorway exit leading to the Channel Tunnel. 'A grim start to a holiday' Jump to media player Chris and Alison McCabe say they have had "a grim start" to their holiday, after Eurotunnel warns passengers they face long delays due to "migrant activity". Eurotunnel - which manages and operates Channel Tunnel services - says migrant incursions in Calais are now "an almost nightly occurrence". The BBC's Peter Whittlesea explains the route many people take to gain access to the railway tracks.